In September 2017, Microsoft released some long-awaited news regarding the future of popular ERP software suite Microsoft Dynamics NAV. NAV will start a new life – or better, two. In the upcoming months, Dynamics NAV will be released in two different versions, which will share the same code base. Microsoft Dynamics NAV 2018, now planned for release in December 2017, will be the latest “traditional”, on-premises Dynamics NAV version. Then, in spring 2018, Microsoft will release Microsoft Dynamics 365 Business Central (formerly Microsoft Dynamics 365 “Tenerife”), a next-generation solution that is slated to be the successor to both Dynamics NAV and Dynamics 365 for Finance and Operations, Business Edition. Dynamics 365 Business Central will offer the possibility of deployments both on-premises and in the cloud. To begin with, Dynamics 365 Business Central will be available in 14 across Europe and North America, namely Canada, the USA, the UK, Denmark, Sweden, Finland, the Netherlands, Germany, Spain, Italy, France, Austria, Switzerland and Belgium. Other geographies will follow. Dynamics NAV is not new to the cloud: the system has been running in a multi-tenant environment on Azure since the release of NAV 2013 R2 in 2013. At the same time, Dynamics 365 Business Central promises a different kind of user experience. Going forward, Dynamics 365 will become the platform of choice for future versions of NAV, replacing traditional on-premises-only versions. Business Central will feature the full functionality of Dynamics NAV. In the words of Alysa Taylor, General Manager of Microsoft Business Applications & Industry, this will be “a new end-to-end business management cloud solution – an expansion of Dynamics 365 Finance and Operations Business Edition adding the full capabilities of Dynamics NAV”. Business Central users will be able to leverage the whole Microsoft stack. The seamless integration to the Microsoft ecosystem of solutions (think Microsoft Office, PowerApps, Microsoft Flow, Power BI, Cortana, and more) will boost productivity, breaking down the barriers between processes. Moving from Dynamics NAV 2018 to Dynamics 365 Business Central will be simple – it will feel just like another Dynamics NAV upgrade, promises Marko Perisic, General Manager Microsoft Dynamics 365.
Business Central will be connected to the Common Data Service (CDS), which supports easier flow (and synchronization) of data between systems and apps. The key innovation is that the system uses a single source of data, which is accessed by multiple apps, rather than storing the same data more than once, and then synchronizing it. Partners will be able to build customized solutions. The advised method is through Events and Extensions, a technology introduced in Dynamics NAV 2016 as a way to modify the system without directly altering the source resources. Extensions simplify the process of deploying, managing, and upgrading customizations or localizations. It will, however, also be possible to build embed apps in Tenerife. AppSource will become a valuable marketing platform for Microsoft partners. The marketplace will be extended to include not only apps and extensions, but also consulting offerings. Users will be able to access all AppSource content straight from their Dynamics 365 platform. At LS Retail, we are very excited about the Dynamics NAV release plans. We plan to meet Microsoft’s schedule, releasing two different versions of our leading retail management system LS Nav. We are especially looking forward to the release of Microsoft Dynamics 365 Business Central, because it fits very well with our vision of the future as hybrid. 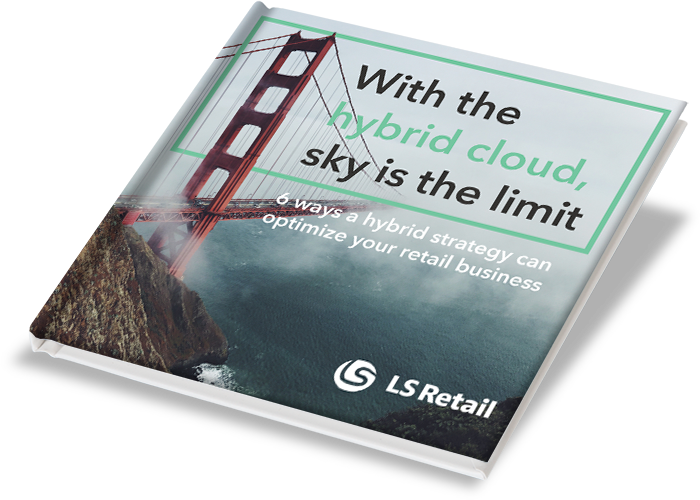 We believe that, in the future, retailers will increasingly run a mix of cloud based and on-premises systems – all without sacrificing speed, flexibility or functionality. And now learn our plans for LS Nav, and to discover how we are going to make the hybrid plan a reality. And for more details don't hesitate to contact us. Learn why the majority of large enterprises are selecting a hybrid cloud model, and what benefits it could bring to your business.